We’re excited to see increasing stability and growth as Advoz’s had its first full fiscal year as a merged entity ending May 31, 2018. This report outlines the many people engaged in our dialogue programs along with the funds raised and expended for that work. 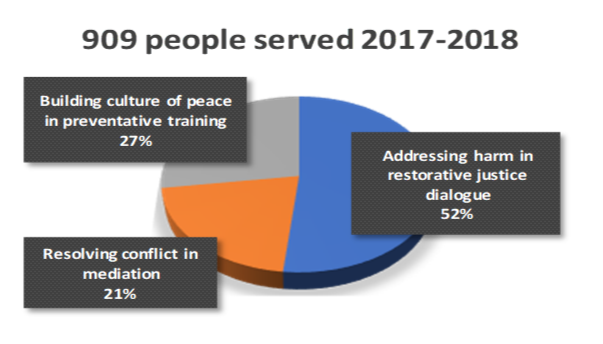 The graphs do not depict the nearly 100 dedicated, skilled and trained facilitators, mediators and trainers who donate their time to make resolution and restoration possible and affordable for so many. Thank you for your contribution towards Advoz’s growth this year through meaningful dialogue. If you want to continue your support into 2019, you can get involved by making a donation or volunteering.